How do I embed content, tasks and assessments in Schoolbox? 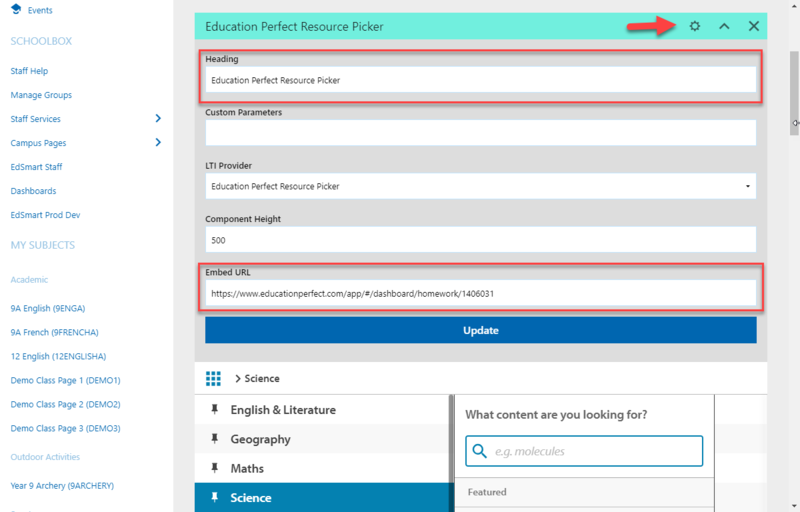 Content can be embedded in Schoolbox by copying a link to a lesson, task or assessment from the Control Panel into the Schoolbox dashboard. Teachers will need to load the Control Panel to create tasks and assessments — once these are created, they can be embedded into Schoolbox easily. Please refer to our guide on setting up an integration between Schoolbox and Education Perfect for more information. Log in to Education Perfect and navigate to (or create) the desired activity. Copy the shareable link for students — this is the first link provided beneath the Your students can already access this task. You can give them this direct link to get them started: header in tasks. See the animated image below for where to find the link in different places within Education Perfect. Note: Please do not use the link titled "or embed this link in Schoolbox" — this is not currently working. Note: make sure you don’t select the Education Perfect option by mistake. From there, click the cog icon to access the settings. Paste the copied URL in the Embed URL box and change the Heading as desired. Click Update. Tasks & Assessments — In the Get Started page. Competitions — In the Details page. Smart Lessons & Translation Lists — In the Content Library under the 'More' drop-down menu in Browse mode, or in the Details section in Edit mode. We do not recommend using the Schoolbox embed link, as this feature is not currently functional. For more information about shareable links, please take a look at our guide on this topic.